Hip is a ball-and-socket joint and it is quite complex from an anatomical and biomechanical point of view. Its role is fundamental to maintain a proper upright position and allow movement. During the intrauterine life and in early childhood, hip undergoes substantial transformations before taking the form of the adult hip. 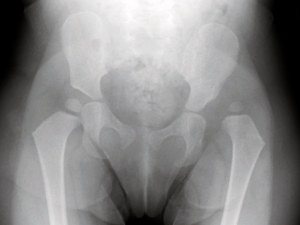 Developmental dysplasia of the hip (DDH) affects the immature hip of the infant and consists in abnormal development of the hip joint resulting in incongruent relationship of the femoral head to the acetabulum. DDH has a clear female predominance and it affects more the left side. Hip Dysplasia has different range of severity depending on the degree of hip looseness and acetabular malformations. Dislocation: This is the most severe case, where the head of the femur is completely out of the socket. But 35% of hip dysplasia and hip dislocation occurs without “risk” factors and any clinical signs. DDH is most often present at birth, but it may also develop during the first year of life. Also, babies with clubfoot may be at increased risk of having congenital hip dysplasia. 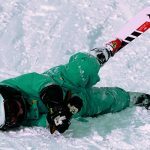 If not diagnosed at an early stage, developmental dysplasia of the hip can potentially progress to hip dislocation and lead to a very disabling clinical situation. Ultrasound is crucial for the diagnosis and treatment. 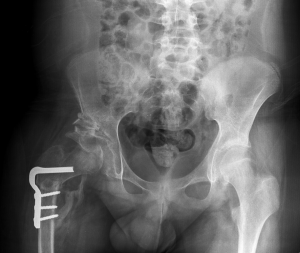 It allows to see the degree of development of the hip prior to ossification. It is a short-lived and absolutely harmless examination for the baby. We advise to undergo it within the first 12 weeks of life so that it is possible to plan the correct treatment and follow up immediately in case of pathology. Once there is a significant ossification then x-ray examination is required due to the impossibility to perform the ultrasound. Dysplastic and Dislocated hips in newborn should be held in the correct place by a brace or harness. There are different braces but in any case the baby must wear it for 6 to 12 weeks to hold the femoral head in the socket. In case of hip instability or true dislocation the femoral head should be reduced and maintained in the correct position with a fixed abduction brace. The device is worn usually for 6 to 12 weeks depending on the severity of the dislocation and instability. Follow-up examinations must be scheduled every 6 weeks. In this age group nonsurgical treatments may still work even if any harness is rarely successful after 6 months. Babies can be treated with spica casting (or “closed reduction”) to hold the hip in the right position. If the dislocation is more severe or if “closed reduction” is not successful, surgery is necessary with a procedure called “open reduction”. loose muscles that are tight. After surgery a spica cast may be applied to maintain the hip in the proper position within the socket. If major dysplasia is present it may become necessary in older child some major surgery reconstructing the acetabulum and redirecting the femoral head. 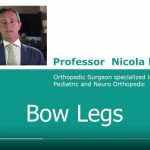 Prof. Portinaro has been treating hip dysplasia for more than 30 years. He has personally performed more than 150.000 ultrasounds on newborn babies and treated non surgically and surgically more than 5000 hips referred also from all other places, with all different techniques required. Prof. Portinaro is one of the most qualified surgeons in the world for hip diseases and treatments, including hip reconstruction.